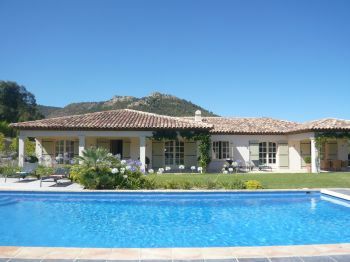 Situated just outside of the picturesque village of Plan de la Tour, this stunning newly built house offers extreme tranquillity within beautiful surroundings. The property has been decorated to an excellent standard, with a well manicured garden and a delightful interior. Lovely living room with 50 inch Samsung plasma with full Sky package (sports and movies etc) and has a Pioneer surround sound system. Open kitchen with top of the range appliances with and dining area which also leads out on to the terrace. Marble floors throughout. A total of four bedrooms (three doubles and one twin), all with en suite bathrooms A superb master suite and private bathroom. Air conditioning in all bedrooms and heated floors throughout. Heated swimming pool 12x6 with electric cover and child security measures. Alarm. BBQ. Garage for 2 cars.